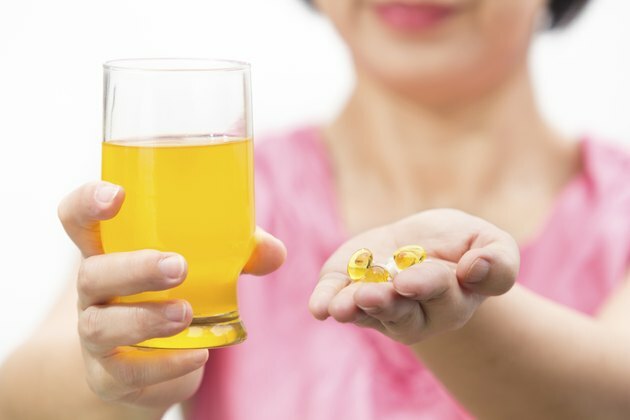 Vitamin B complex supplements usually contain at least six B vitamins – B1, B2, B3, B5, B6 and B-12 -- but they might contain more or fewer vitamins and in wildly varying amounts. You might obtain 10 percent of the recommended daily allowance, or RDA, for one B vitamin and 6,000 percent of another. However, taking high doses of some B vitamins could increase your appetite and possibly lead to weight gain. If you are underweight and want to add some pounds to your frame, ask a doctor if taking a stand-alone B vitamin or B complex supplements could help you gain weight. If you are deficient in some B vitamins – B1, for instance – you might suffer from appetite loss. Taking extra B1, also known as thiamine, might help revive your appetite. The recommended dose of B1 to treat a thiamine deficiency ranges from 5 mg to 30 mg a day and up to 300 mg for severe deficiency. A vitamin B complex supplement might contain more or less thiamine than you need. A doctor can prescribe thiamine or other B vitamins in the proper amounts. If you want to lose weight or maintain your current weight, taking vitamin B supplements might hinder or help your efforts. An increased appetite could lead to weight gain, but some B vitamins could also treat low blood sugar or boost your energy, possibly making it easier to resist unhealthy between-meal snacks. Read the labels before you purchase vitamin B complex. If it contains high amounts of thiamine or pyridoxine – B1 and B6 – you might notice an increase in appetite. If it contains high amounts of vitamins B2, B5 and B-12, you might obtain an energy boost that helps you resist overeating. Keep in mind, however, that science supports the idea of taking extra B vitamins to treat deficiencies. No serious proof exists that taking more B vitamins than you need will lift your energy or appetite beyond normal levels. While taking vitamin B complex might not help you prevent or achieve weight gain, it can produce a number of unwanted side effects, such as skin rashes, diarrhea, vomiting, sleepiness and headaches. If you take high doses of some B vitamins, particularly for a long time, you might incur more serious health consequences, including loss of vision, stomach ulcers, gout and problems with your liver, nervous system and brain. Use caution when purchasing vitamin B complex supplements, especially if they contain high amounts of vitamin B3, or niacin, and/or vitamin B6, or pyridoxine. If you want to gain weight, add more calories to your diet. Choose healthy, calorie-dense foods such as nuts and seeds to munch on between meals. If you want to gain muscle weight, resistance training can help. Adding protein to your diet can also help you gain muscle weight, but most people get enough protein – 5 oz. to 6 oz. daily – in their regular diets. If you want to avoid weight gain, include more fiber in your diet. Fiber-rich foods help fill you up and keep you feeling full. Good, low-calorie, high-fiber choices include broccoli, oatmeal, black beans, apples and brown rice. What Are the Side Effects of Super B Complex? Do B Vitamin Supplements Make You Hyper? Can Vitamin B Complex Cause Bloating?